Family Of a Vet - PTSD, TBI, & Life After Combat: Today in my life... let's talk about SUICIDE. I typically share these "today in my life" updates on my private Facebook wall, but it is with a heavy heart tonight... and an ongoing mission... that I share it here, and several other places as well. I hope that you'll do the same.... I pray that you'll do the same. We've *GOT* to move people to action. I am the founder of Family Of a Vet and in that role I talk to, by phone, e-mail, and message, hundreds of veterans and loved ones a month. Truthfully, I've lost count.... and not because I don't care to count, but because these people are *SO* much more than numbers to me. They're family... heroes... and mirrors of myself and my own dear hero. There was a new study highlighted this week in the headlines, stating what most of us who work in this "world" already know. The suicide rates among our heroes are continuing to climb. The members of our military, our veterans, and their spouses and caregivers are at an EVER INCREASING RISK OF DYING. In the last few days alone, I've talked with two people who attempted suicide, one who stopped at the last moment, and to the loved ones of three heroes who were lost to suicide. TWO days... SIX people directly tied to these "statistics" we're talking about. It's heartbreaking... and it's everywhere. If I chose to, I could let the the sadness of this overwhelm me, but I won't. I refuse to. Instead, I choose to call out to you... to the world... and beg for, plead for, and demand help. 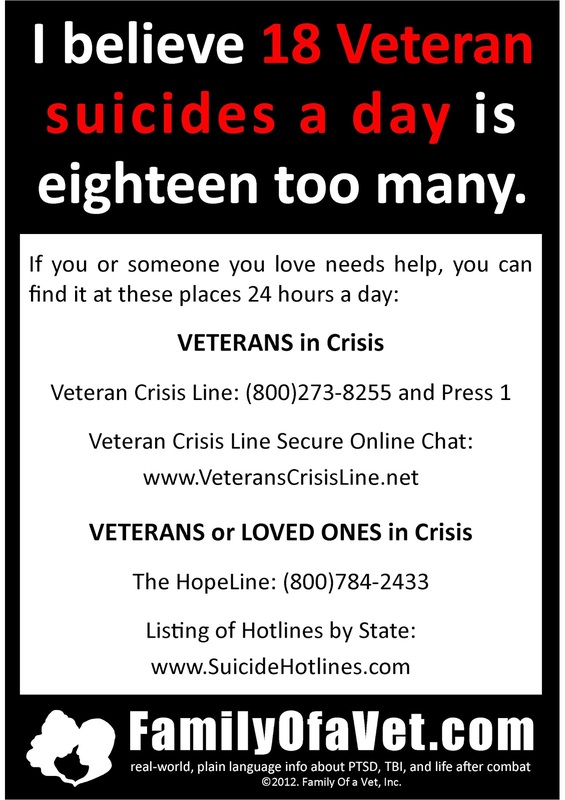 There are studies that indicate the suicide rate among veterans (currently said to be 18 per day... 1 every 80 minutes) is approximately 2 or 3 times that of the "average" population. The military suicide rate is now officially also higher than that of the average person. So basically, being a hero makes you more likely to die at your own hand. There's something incredibly, terribly, monumentally wrong with that. We *HAVE* to stop waiting for someone else to "fix" this... for the government, or the military, or the VA, or whomever, to come up with the solution. While they're catching up to a problem no one was prepared for, people are dying... and they're dying fast. So, what can we do? Believe it or not, there are some straightforward (while not completely simple) answers that CAN help. First - If you know a Veteran, get informed about PTSD (post-traumatic stress disorder) - a leading cause of suicide. You can click HERE to get started. If you don't know a Veteran, go to your local VA, Veterans Service Organization (like the VFW or American Legion) and tell them you want to help a local veteran. I promise they can find you someone. Make a connection. Get involved. Let these heroes (and their families) know you care. 1% of our population has served in the military... that leaves 99% to be the eyes and ears... the watchmen... the lifelines. Surely that's an even trade? They laid themselves down for your freedom... so now you spend a little time trying to make sure they don't die as a result? Second - Don't be afraid to TALK about suicide. Saying "Are you thinking about killing yourself?" is not going to cause someone to suddenly decide to commit suicide. *BUT* not asking can be a matter of life and death. If they answer yes, then call their local VA Mental Health Department (during business hours, if they aren't immediately at risk) or the National Crisis Hotline (available 24 hours a day, for those immediately at risk, or those who are worried they might be). The number for the Hotline is 800-273-8255. Press 1 if you're a Veteran, anyone else can just dial directly. By pressing 1, Veterans can get help, referrals, and a host of other services within the VA.
Third - Help us spread awareness and keep this conversation *GOING*. Share this blog post. And, if you're on Facebook, please CLICK HERE to share a photo with a ton of information about who heroes and family members can contact if they're in crisis (the same photo featured at the top of this blog post). HELP US SAVE LIVES. It's not up to "them"... it's up to each and every one of us. Heroes dying is not okay. Caregivers dying is not okay. We've got to start not only paying attention but TAKING ACTION. Suicide is anger turned inward. It's listening to the person that is angry, letting them get it outside of themselves. They don't need advise, they just need someone to listen. Getting the anger outside themselves will help them see what good people they are. If we talk while they are talking it make them shut down. Offer Empathy, not sympathy. Don't act shocked. Allow expressions of feelings. Accept the feelings. Show interest and support. Be non-judgemental. Don't debate whether suicide is right or worng, or feelings are good or bad. Don't lecture on the value of life. Offer Hope that alternatives are available but don not offer glib reassurance. It only proves you don't understand. Take Action . Remove means. Get help from persons or agencies specializing in crisis intervention and cuicide prevention. Most important be be available, learn the warning signs. They do offer classes on Suicide training as well. Question the Person about Suicide. Do they have thoughts? Feelings? Plans? Dont' be afraid to ask. Persude the Person to Get Help.Listen carefully. Purchasing a gun or stockpiling Pills. I hope this help's training from class on Suicide Prevention, it is a free class that can save lives. These are great suggestions you made. 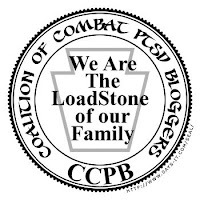 My husband is an army vet and suffers from PTSD. He has told me that he has often thought about suicide but what has stopped him every time is the love and support from his family and friends. It is important that we understand what our loved ones are going through so we can better help them. http://onlineceucredit.com/edu/social-work-ceus-nd offers a lot of great information about PTSD and coping with the symptoms of it. I hope this is helpful. I am a psychologist in training who is just passing through. I was at a conference about suicide recently, and I felt that I should add that successful suicide attempts almost always follow agitated moods. In other words, if you see someone who you feel is at risk in an unusually agitated, energetic mood, watch them very closely. If they want to know why you won't leave them alone, explain your fear. Tell them how you are worried for them and want to be by their side.